The lowdown on why the spanking-new US 'stealth' fighter may be a more dangerous proposition than old-fashioned F-15s. Israel has already acquired several F-35 stealth fighters from the US, and we're set to acquire about fifty more, if the rumors are true. But are F-35s in Israel's best interest? Assuming we don't need F-35s to fight Hamas, Hezbollah, the Palestinian Authority, or "lone-wolf" terrorists, the main enemy our pilots will fight is Iran. The problem is that the F-35 may not be able to eliminate Iran' stockpile of nukes. What's so special about the F-35, and why does Israel want it? The F-35 is a spanking-new stealth fighter, incredibly difficult to track via radar. 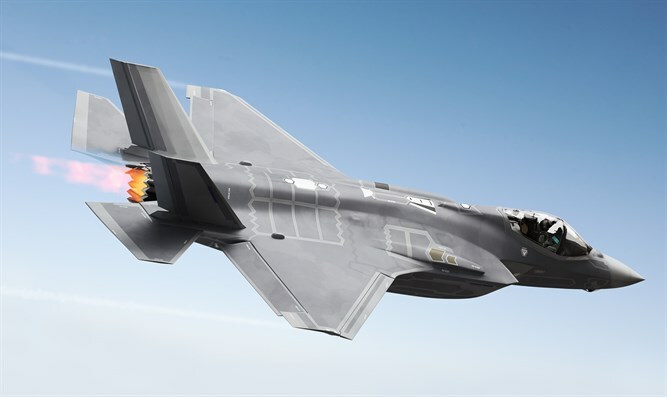 Its stealth capabilities help pilots evade sophisticated missile systems, and the plane itself can carry a relatively wide array of weapons. The F-35 travels at a supersonic speed of about 1,200 miles (1,900 kilometers) per hour (a speed of March 1.6). Though the seat's headrest partially blocks the pilot's view, cameras mounted on the plane provide 360-degree vision. Plus, the stealth fighter has both night vision and thermal vision. The pilot's helmet includes an operating system, and the data appearing on its visor is also shared elsewhere. In short, the F-35 is a plane with lots of advanced capabilities. The dangerous catch? Easily spotted = easily reported. While the F-35 is considered to be the best fighter in the world, in reality, it has a few serious flaws. First and foremost, it's easily reportable. All Iran needs in order to know we're there is an alert civilian living on the border. Why? Because that plane makes a racket. No, seriously. If you don't live near enough to an army base for training to be going on over your head (I do), you don't know. The F-35 may be flying a few kilometers above you, but you won't be able to hear anything other than its noise until the plane has passed far enough away. Let's say...for about 45 seconds. Worse, its sound is different than any other plane's. So different, in fact, that once you hear an F-35 a few times, you can't mix it up with anything else. Let's say there's an Iranian citizen living on the country's border. He knows what the planes flying over his head sound like, because he hears them every day. They're part of the background music. Suddenly, he hears something much, much louder. By the time he looks out the window, he can't see anything. But he sure can hear it - and he knows it's a plane. Our civilian goes over to the phone, calls the authorities, and says, "Are we at war? Did you get new planes? A massively loud plane just flew over my head, and it sure doesn't belong to us!" And not all of the Negev's citizens are faithful to Israel. I'm sure some of my Bedouin neighbors have learned to recognize the F-35 - and I'm also sure that some of those neighbors are more faithful to Iran and terror groups than they are to the State which provides them with free health care, good education, and a Western lifestyle. Proof: They steal weapons from the IDF, right, left, and center. Iran may not even need an alert citizen on the border, if they have intelligence from a Bedouin that our F-35s are heading their way. Or maybe, our nice Bedouin will call his Iranian friend. "Hey, Mahmoud! A bunch of F-35s just flew over my head. They seem to be going your way - keep your eyes peeled. If I'm right, they'll reach you in about an hour and a half." Israel may be able to take out Iran's nukes before that alert goes out to the Iranian Air Force. And it may not. Either way, there's a high chance our pilots will have to dogfight before coming home. The F-35 pilot will lose. Can he outspeed his opponent? Possibly - that depends on what he's facing. He may not be able to outrun an F-14, F-15, or F-22. And either way, we need to take out Iran's nukes. Just because they found us out, doesn't mean we can back down. What it means is that some of our pilots will have to fight so the bombers can do their job. And if our pilots have to fight, some will die. Why not borrow F-14s or use F-15s, disguise them as Iranian, and do the deed undercover?